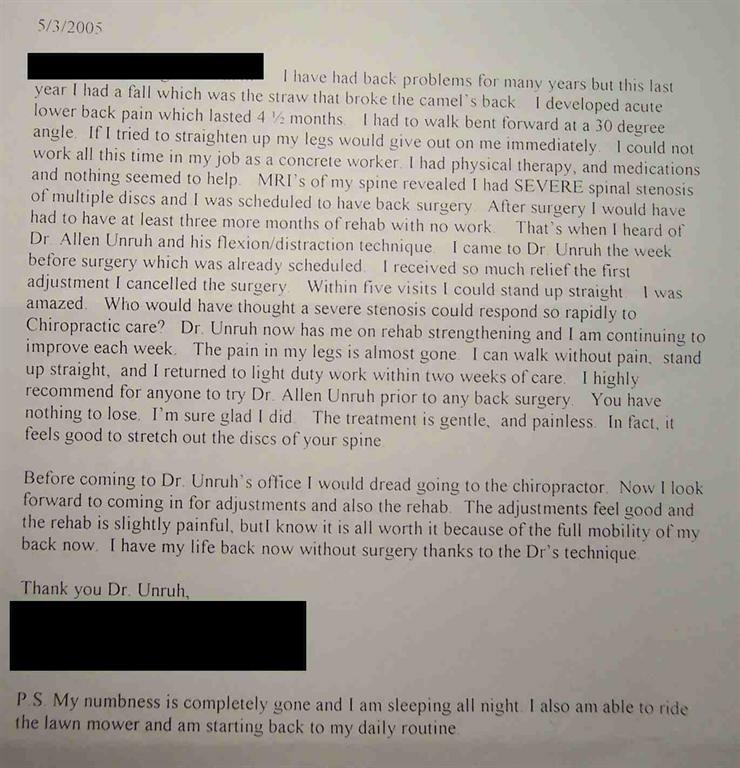 "I have had chronic low back pain and leg pain for years. 1. You can learn to live with the pain (not an option). 2. You can go live in the nursing home and cope with it by taking drugs. 3. You can try one last ditch effort to improve your health naturally. If you decide to try our method of care distracting the spine, it will take at least a two month commitment at about three times a week. "I decided to commit to two months of regular care as the nursing home didn’t sound exciting, and with surgery I may never walk again. "... the specialized care with the distraction instrument [The Cox® Table] Dr. Unruh uses is gentle and it feels great to be stretched. ... I’m not living on pain pills any more." "...after just one week of treatments, my shooting leg pain subsided almost 75% and the last thought on my mind was going in for back surgery. I was amazed at the progress I had made in such short time." Click here to read Shawna's letter. "I canceled the surgery. I started to get relief right away. The treatment felt great. It was very relaxing. Gradually the pain went completely away. I can turn my head any direction without pain. I have no arm pain. I can sleep all night and am not taking any medication at all." Click here to see/read Elaine's letter. "Thanks to your technique and Dr. Jakob, I have canceled my appointment with the surgeon. Dr. Cox, not only am I completely convinced that this technique works, I am literally walking proof. I would have never thought that I could have the health that I have today without surgery. Those around me agree as they have watched the transformation before their eyes. I understand that I have a way to go but I am still in awe of my improvement and confident in my recovery." 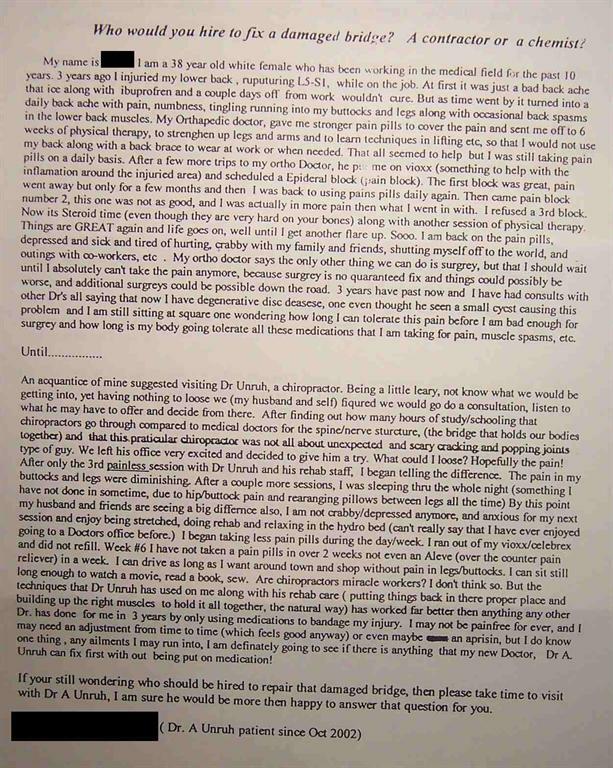 Click here to see/read Joline's letter. An influential chiropractic physician inspires a young patient to become a chiropractor. The doctor explained that "He attributes a lot of that to the training he has gotten through being certified in the Cox® method." Click here to read her email. 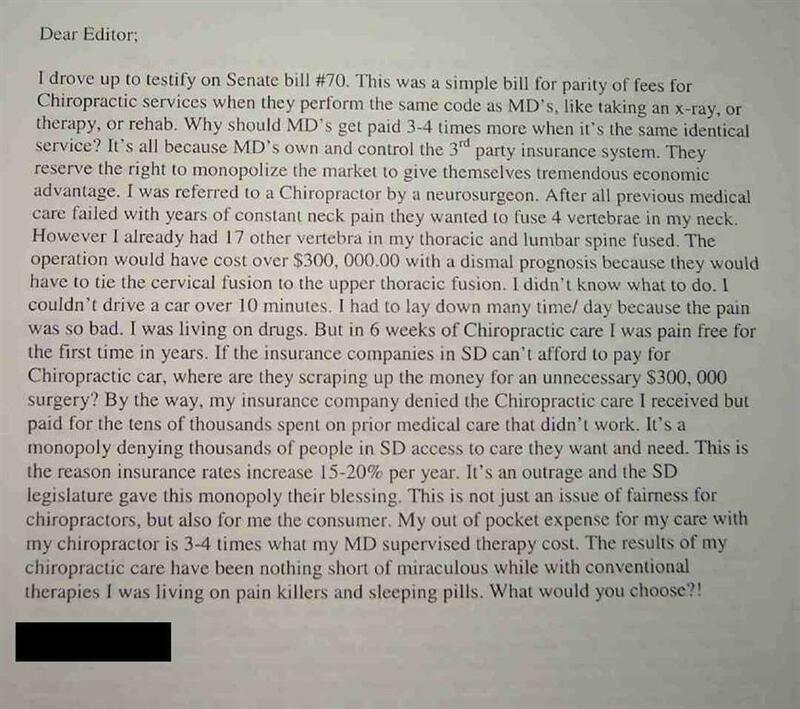 MDs told him to "learn to live with it" -- motorcycle accident victim, suffers with back pain for 32 years, told chiropractic could paralyze him, goes and have relief within 6 weeks. Click here to see/read his letter: (Page 1) & (Page 2). What a revolution in chiropractic care are these new Cox tables! I couldn't imagine you had adjusted both hips with no "crunching"...I have always worried that I was going to war my chiropractor out before his time; but with the help of these new tables, hopefully we can both gracefully grow old together! My name is Calvin V (a patient of Dr. Allen Unruh's). Do nothing and hope it goes away – the odds are zip. Live on drugs - only treats the symptoms. Have back surgery – skip the trip and be laid up for quite a while. It’s risky and very expensive. Last, get Chiropractic adjustments with the Cox distraction instrument daily for a month, and there is a good chance the pain and inflammation would subside enough to go on the trip. Also, he explained that often blood clots like this can reabsorb in the body as he continually distracts the discs apart. The distraction also creates a suction on the disc to bring the extruded disc off the nerve. I went on the trip. Rode 2600 miles in 4 days and I continue to feel great. Like Dr. Unruh said he does not take the credit because the human body did the miracle. His job is to convince people to have more faith in the human body than man made chemicals and a knife. 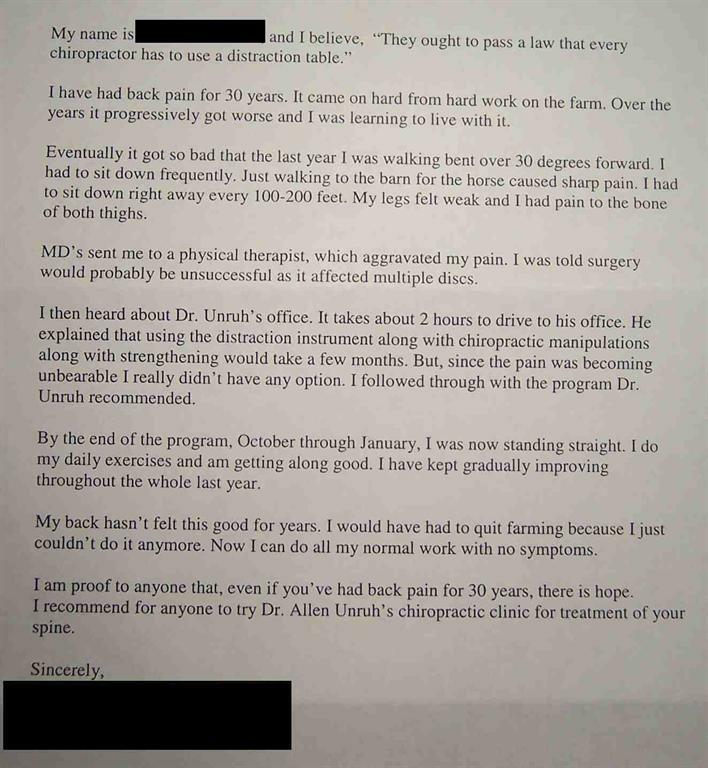 I’m sure glad I did and highly recommend anyone else with sciatic pain like I had to get see Dr. Allen Unruh [editor comment: or a certified doctor like Dr. Unruh)] FIRST! On the first MRI study of the lumbar spine performed 6-3-10, the size of the right L5-S1 lateral epidural space heterogenous soft tissue mass measured 150 sq mm. On a follow-up MRI study of the L5-S1 level on 7-9-10 revealed mild interval decrease in size of the previously seen heterogenous soft tisssue mass in the right lateral epidural space to 120 sq mm with decrease in the deformation of the right lateral thecal sac. This reports a 20% reduction of the size of the herniated disc in a 36 day treatment period. Literature shows varying reports of the degree of disc reduction size in pre and post MRI studies of successfully treated lumbar disc herniation cases. The reductions range from zero to 100% reduction with some cases even showing increased size of the disc herniation in patients relieved of radicular pain. Authors have stated there is little correlation of the size of disc herniation to patient symptoms and the majority of asymptomatic people will show disc herniation on MRI study.